Wow what an amazing look. I absolutely love the skirt and shoes. I’ve been wanting a LV graffiti bag since I was 15 and saw it in Teen Vogue and that necklace is just too cute. This is a gorgeous outfit! Love everything about it, especially the colors! OMG, this dress is amazing! I’m crazy about butterflies! do you know if it’s still available on Asos? PS. Off to search for those booties. Where did you get them? Do you think I’ll have luck at Zappos? Thank you!! I found them at Nordies towards the end of summer. I hope you can find them, they work with so many things! aline you look awesome! i like your necklace, purse, shoes, sweater, skirt… ok everything. That’s a super fun maxi skirt. Also, you have a great blog layout. you look absolutely gorgeous!! i LOVE you maxi skirt!! the print is so pretty! this outfit is perfection. Seriously. I want it all. Omg this is amazing!!! You’re my fashion icon. For reals dude. That dress is truly amazing and you combined it perfectly. I’m terrible with patterns, it takes me the world to combine them properly! Love the pattern on the skirt. I absolutely adore that skirt! And the bright sweater goes so well with it! love your dress and those booties! This maxidress is wonderful. When did you buy it? I want it so badly!! I bought it in the summer, but it’s still in the sale section! you look amazing! I have no words & those boots & that necklace! i die! great dress and great way of styling it too! Just gorgeous. The print on the dress is lovely. What a gorgeous outfit! 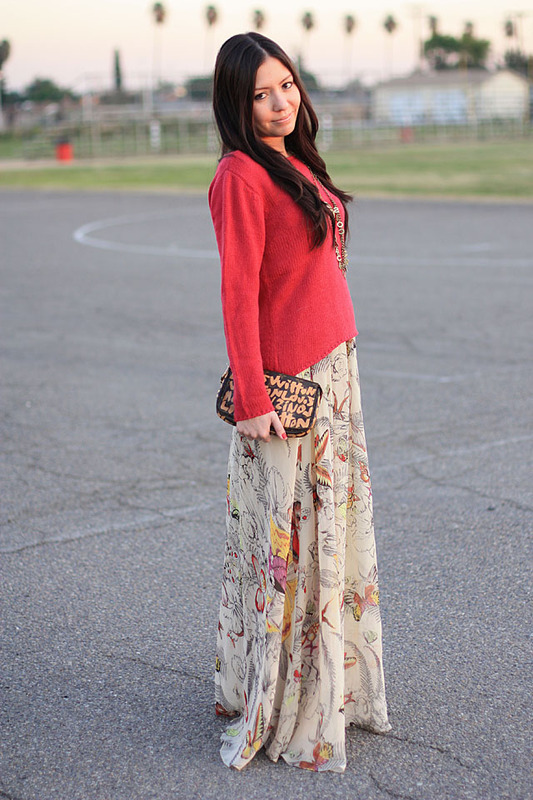 Love the maxi with the sweater! Holy adorable – that dress is FANTASTIC! I love your skirt and your shoes are so fabulous! This is a fantastic outfit! I love it. 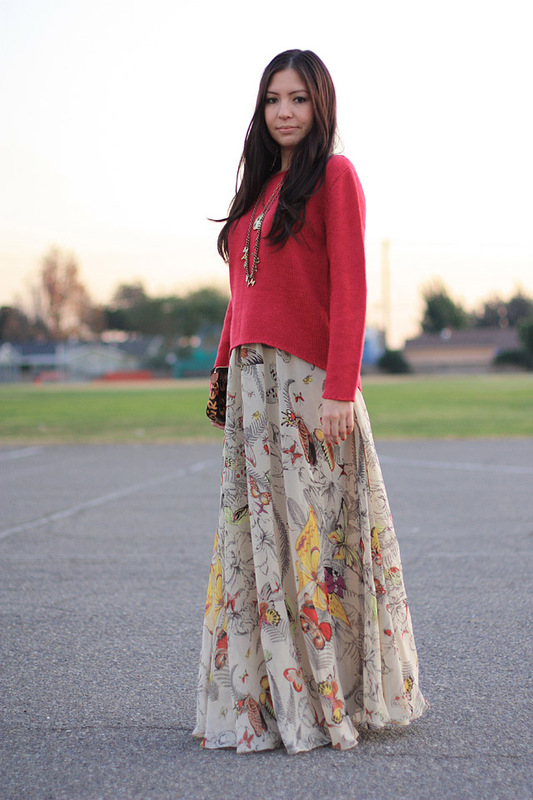 The print and red sweater look perfect together and make the colors in this look flourish. I’m following you now!!! love this outfit! so pretty! Your hair is soooo long! I’m envious. I’m also envious of this gorgeous maxi dress you managed to unearth from the thousands of skintight minidresses on the ASOS website. I always throw in the towel after an hour or more of fruitless searching. I need them to edit their stock down so I can find the good stuff! IT IS SOOOOOO HIT OR MISS!!! It certainly is my first stop for finding “Vegassy” dresses, but you can occasionally find some real gems in there… it just takes a lot lot lot of scrolling! This is such a great layering outfit, you make it look so effortless!